Hand Forged Musha Damascus Steel Katana Sword With Scabbard | BUDK.com - Knives & Swords At The Lowest Prices! 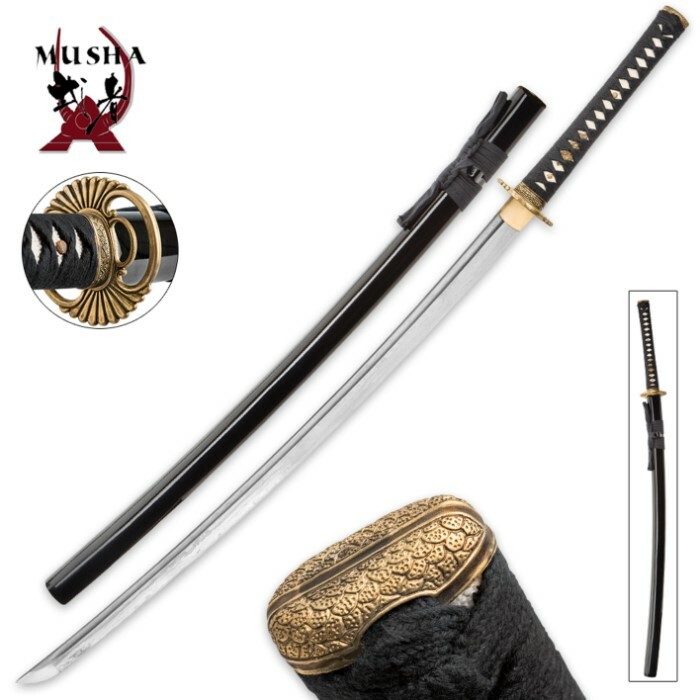 This hand-forged Musha sword features a 28" Damascus steel blade complete with a heavy fuller groove and razor-sharp edge right out of the box. Traditional elements abound including a decorative brass tsuba and pommel with an antique finish and a solid brass habaki blade sleeve. The handle features genuine ray skin and decorative cord wrappings accented by an attractive menuki ornament. A matching hardwood scabbard houses the blade. I got this sword a while back, and forgot to write a review. It's balance is impeccable. I'm yet to hold a blade as nice as this one. It's shimmering blade glides through obstacles as if nothing was there. Be careful and understand its limitations. It's just a sword. It's not invincible. Although you'll feel invincible while holding it. Definitely a wonderful purchase. Just received this product and I have to say, it's beautiful! Just what I wanted. Real quality steel, sharp out of the box. Nice brass hardware, and great finish on the scabbord. It came with a beautiful storage box, as well as a cleaning kit. I'm impressed with what u get for the money. Great job trueswords!! Just received my sword, which took 8 days to arrive. Removing the plastic wrap from the blade, by pulling it very slightly against the sharp edge, it almost fell off the blade! Looking intently down the length of the blade, there were absolutely no ripples in it. Straight! The damascus pattern is beautiful. I am not an expert on scabbard fit, so no opinion. Everything was nicely finished, with one minor problem, a very small pea sized smudge of glue or something on the outside of the presentation case. Purchased and love the sword. However, The scabbard doesn't fit well at all, and the sword falls out easily just with gravity. Major disappointment. My advise is for the manufacturer to put more then 3 minutes of time to make sure the scabbard fits and holds the sword well for a long time and not just barely! I have had this sword for four days now and i am very pleased. This is a very nice sword for the price, it arrived in a timely manor (five days) The blade is sturdy, the grip is very tight. A complaint i had was the blade seemed to be stained or looked "dirty" some steel wool got rid of most of it but it is hardly noticeable and didn't take away from the quality of the sword. The edge is not razor sharp but it can cut. about five minutes with a wet stone made it extremely sharp. the saya (sheath or scabbard) is tight and when held upside down the sword does not fall out, but it is also not difficult to pull out yourself. the blade flexes and has not bent for me yet. i would recommend this sword to anyone who wants a functional and beautiful piece. Just received my Musha Sharp Damascus. Payed for three day shipping but it took four days (UPS blew scheduled delivery date); received undamaged. Comes in a nice light wooden box covered in tasteful black silk with embroidered red flower and vine motif. Katana shows very good overall workmanship and is quite attractive. The damascus pattern is subtle and you need good light at the correct angle to really appreciate it. Blade was true, with very nice medium low polish and had no significant blemishes. Koshirae is very nice and shows good attention to detail. Compared to my Musashi Best katana it feels heavier and not as quick. Tsuka is a little shorter than the Best and I would prefer it a little longer especially with the extra weight. Had a good sharp edge that can cut paper if you use good technique; once again it did not come quite as sharp as my Musashi Best. Hang tag that came with the katana states it is made from 1045 carbon. I knew it wasn't going to have as hard an edge from the 55 HRC rating shown at the True Sword web site. Blade has mono-hardness with no hamon. I was able to make many nice clean cuts on a single water-filled milk jug. However I had trouble with a hard plastic Planter's peanut bottle. In fact, it slightly dented the edge (might have been a result of less than perfect technique). This cleaned up very quickly with a Smith fine diamond hand hone. One thing I find disturbing is that the hang tag refers to the Musha line as for "the budget minded" but in "the same spirit as our Musashi line". This sword cost almost twice as much as my Musashi Best! I was under the impression Musha was just a name change from Musashi, not a "budget" line. Overall I'd probably buy again because of the excellent esthetics and because I think it will be a fine cutting sword on less hard material. Unbelievably sharp sword. This is my first sword. I have been looking at different swords for about 6 months trying to get educated about them and when I came across this one all of the reviews were great so I purchased it. First I was surprised by how fast it came in (just three days)and then by how sharp it was straight out the box. I made a video to show my sons and they were blown away it cut paper like a treet razor blade. I haven't used it on anything yet I hope it holds up like the other reviews said. But so far it is everything I could ask for and more and the price was right on basically I feel like I got much more quality than the price I paid for it. Real nice sword. It was a tad heavier than I expected (mostly because before this I only had stainless steel) and the design you can actually feel so it is true with the lairs. If the design was painted on you wouldnt be able to feel the lairs which makes me confident this was a good buy. This sword is also razor sharp. I ran my fingers along the blade to see how sharp it was and I barely even wanted to have a light touch on the blade because it felt like if I put any weight on the blade it would slice my finger off. Awesome sword. Ranks 2 on my most favorite list. 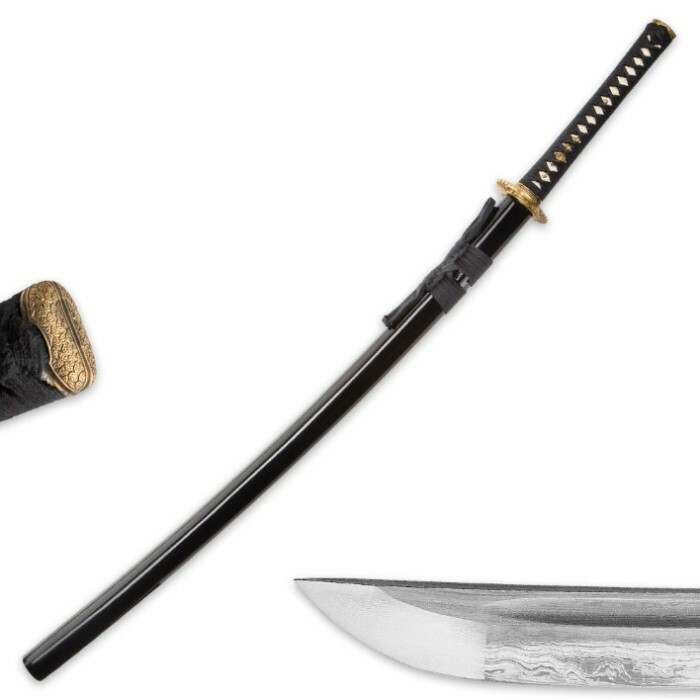 Number 1 is the Shinwa Damascus Double Edge Dragon Ninja Katana Black. It has nice design and has a nice double edge on it and is also razor sharp and a tad more weight. If you like this sword you will love the shinwa damascus.